Totus2us is giving voice to faith, hope and love from all around the world, especially among St John Paul II, Benedict XVI & Pope Francis's 'dearest young people'. Dedicated to Our Lady, Totus2us wants to highlight what's good, true and beautiful, to help us to pray and not be afraid to follow Jesus Christ. There are voices from 127 countries on over 40 audio Totus2us podcasts. All free, all with music and on Totus2us RSS feeds, Spotify and iTunes (& other providers we can't keep up with :o) Most mp3 episodes are under 10 minutes and fall broadly into 3 areas: prayer (faith / way), Catholic teaching (hope / truth) and witness (love / life). "Hoy, tráeme a las almas que verán y glorifican Mi misericordia de modo especial y sumérgelas en Mi misericordia. Estas almas son las que más lamentaron Mi Pasión y penetraron más profundamente en Mi espíritu. Ellas son un reflejo viviente de Mi Corazón compasivo. Estas almas resplandecerán con un resplandor especial en la vida futura. Ninguna de ellas ira al fuego del infierno. Defenderé de modo especial a cada una en la hora de la muerte." Jesús misericordiosisimo, cuyo Corazón es el amor mismo, acoge en la morada de Tu compasivísimo Corazón a las almas que veneran y ensalzan de modo particular la grandeza de Tu misericordia. Estas almas son fuertes con el poder de Dios Mismo. En medio de toda clase de aflicciones y adversidades siguen adelante confiadas en Tu misericordia, y unidas a Ti, cargan sobre sus hombros a toda la humanidad. Estas almas no serán juzgadas severamente, sino que Tu misericordia las protegerá en la hora de la muerte. Padre Eterno, mira con misericordia a aquellas almas que glorifican y veneran Tu mayor atributo, es decir, Tu misericordia insondable y que están encerradas en el compasivísimo Corazón de Jesús. Estas almas son un Evangelio viviente, sus manos están llenas de obras de misericordia y sus corazones, desbordantes de gozo, Te cantan, Oh Altísimo, un cántico de misericordia. Te suplico, Oh Dios, muéstrales Tu misericordia según la esperanza y la confianza que han puesto en Ti. Que se cumplan en ellas la promesa de Jesús quien dijo: “A las almas que veneren esta infinita misericordia Mía, Yo Mismo las defenderé como Mi Gloria durante sus vidas y especialmente en la hora de la muerte. "Aujourd’hui, amène-moi les âmes qui honorent et glorifient particulièrement ma miséricorde et immerge-les dans ma miséricorde. Ces âmes ont le plus vivement compati aux souffrances de ma passion et ont pénétré le plus profondément dans mon esprit. Elles sont le vivant reflet de mon cœur compatissant. Ces âmes brilleront d’un éclat particulier dans la vie future, aucune n’ira dans le feu de l’enfer, je défendrai chacune d’elles en particulier à l’heure de la mort." Très miséricordieux Jésus dont le Cœur n’est qu’amour, reçois dans la demeure de Ton Cœur très compatissant les âmes qui honorent et glorifient Ta miséricorde. Ces âmes sont puissantes de la force de Dieu Lui-même ; au milieu de tous les tourments et contrariétés, elles avancent confiantes en Ta miséricorde, ces âmes sont unies à Jésus et portent l’humanité entière sur leurs épaules. Ces âmes ne seront pas jugées sévèrement, mais Ta miséricorde les entourera au moment de l’agonie. Père Eternel, jette un regard de miséricorde sur les âmes qui glorifient et honorent Ton plus grand attribut, c’est-à-dire Ton infinie miséricorde, qui sont enfermées dans le Cœur très compatissant de Jésus. Ces âmes sont un vivant Evangile, leurs mains sont pleines d’actes de miséricorde et leur âme débordante de joie chante l’hymne de la miséricorde du Très-Haut. Je t’en supplie mon Dieu, manifeste-leur Ta miséricorde selon l’espérance et la confiance qu’elles ont mis en Toi, que s’accomplisse en elles la promesse de Jésus qui leur a dit : les âmes qui vénèreront mon infinie miséricorde, je les défendrai moi-même durant leur vie et particulièrement à l’heure de la mort, comme ma propre gloire. "Hoje, traze-Me as almas que veneram e glorificam de maneira especial a Minha misericórdia e mergulha-as na Minha misericórdia. Estas almas foram as que mais sofreram por causa da minha Paixão e penetraram mais profundamente no meu espírito. Elas são a imagem viva do meu Coração compassivo. Estas almas brilharão com especial fulgor na vida futura. Nenhuma delas irá ao fogo do Inferno; defenderei cada uma delas de maneira especial na hora da morte." A alma que glorifica a bondade do Senhor É por Ele especialmente amada;É por Ele especialmente amada; Ela está sempre próxima da fonte viva E bebe as graças da misericórdia divina. Eterno Pai, olhai com misericórdia para as almas que glorificam e honram o Vosso maior atributo, isto é, a Vossa insondável misericórdia. Elas estão encerradas no Coração compassivo de Jesus. Estas almas são o Evangelho vivo e as suas mãos estão cheias de obras de misericórdia; suas almas repletas de alegria cantam um hino da misericórdia ao Altíssimo. Suplico-Vos, ó Deus, mostrai-lhes a Vossa misericórdia segundo a esperança e a confiança que em Vós colocaram. Que se cumpra nelas a promessa de Jesus, que disse: As almas que veneram a Minha insondável misericórdia, Eu mesmo as defenderei durante a sua vida, e especialmente na hora da morte, como Minha glória. Amém. The Divine Mercy chaplet is also here on Totus2us in Arabic, Czech, German, Greek, Latin, Polish & Slovak. "Mary is the patron of our country for almost 400 years now and she has managed to protect us and safeguard us; without this intercession we probably would not be an independent country. And she keeps protecting us through the ages, through all these hardships that we have, like from forest fires to political and economic crises, and she’s always there to listen to our needs. Since she has this enormous heart that keeps us in her embrace and safe, she has also given us an example of how we ourselves should behave and do the same for others, and this is why we can never be grateful enough for what she has been doing for us." On Sunday 13 October 2013, Pope Francis consecrated the world to the Immaculate Heart of Mary in front of the statue of Our Lady of Fatima in St Peter's Square. In June 1981 (just a month after the assasination attempt on JPII on the Feast of Our Lady of Fatima), it was reported the Blessed Virgin Mary first appeared to 6 children in Medjugorje (in what was then communist Yugoslavia), introducing herself to them as the 'Queen of Peace'. The 6 visionaries say she has been appearing every day since. "And if yesterday, with the women, we contemplated “the one whom they have pierced” (cf Jn 19, 36; cf Zech 12, 10), today with them we are called to contemplate the empty tomb and to listen to the words of the angel: “Do not be afraid… He is risen” (Mt 28, 5-6). Words that want to reach our deepest convictions and certainties, our ways of judging and dealing with everyday events; especially our way of relating with others. The empty tomb wants to challenge, move, question us, but above all it wants to encourage us to believe and trust that God “happens” in any situation, in any person, and that his light can reach into the most unpredictable and closed corners of existence. He has risen from death, he has risen from the place from which nobody awaits anything and He awaits us – as He awaited the women – so as to render us participants in his work of salvation. This is the foundation and the strength that we have as Christians so as to spend our lives and our energy, intelligence, affections and will in seeking and especially in generating pathways of dignity. He is not here… He is risen! It is the announcement that sustains our hope and transforms it into concrete gestures of love. How much we need to let our fragility be anointed by this experience! How much we need our faith to be renewed, our myopic horizons to be challenged and renewed by this announcement! He is risen and with Him rises our creative hope to face actual problems, because we know that we are not alone." Francis: "And Jesus calls her “Mary!”: the revolution of her life, the revolution destined to transform the existence of every man and woman, begins with a name which resounds in the garden of the empty sepulchre. The Gospels describe for us Mary’s happiness: the resurrection of Jesus is not a joy given with a dropper, but a waterfall that cascades over the whole of life. Christian existence is not woven with soft happiness, but with waves that sweep over everything. Try to think, you as well, in this instant, with the baggage of disappointments and failures that each of us bear in our hearts, that there is a God close to us who calls us by name and tells us: ‘Arise, stop weeping, because I have come to liberate you!” This is beautiful." Fr Dominic Faure: "So the first dimension of the joy of Christ: to be in the Father, from the Father, turned towards Him and that’s the Prologue of the Gospel of John. And the second dimension of the joy of Christ is a joy towards us and there there are many, many moments in the Gospel where we see that, especially in St Luke, all the parables on mercy …. It’s a joy of giving. I was going to say thanks to the Incarnation and the Redemption, Jesus can manifest and experience in his humanity a new joy, the joy of giving. As a Son his joy is first of all to receive and as a Son Incarnate Redeemer it is also the joy of giving, giving mercy, giving mercy, giving mercy. The joy of receiving from the source and the joy of becoming also a source for us." "I join my voice today to the voice of Paul VI and my other predecessors, to the voices of your religious leaders, to the voices of all men and women of reason, and I proclaim, with the conviction of my faith in Christ and with an awareness of my mission, that violence is evil, that violence is unacceptable as a solution to problems, that violence is unworthy of man. Violence is a lie, for it goes against the truth of our faith, the truth of our humanity. Violence destroys what it claims to defend: the dignity, the life, the freedom of human beings. Violence is a crime against humanity, for it destroys the very fabric of society. I pray with you that the moral sense and Christian conviction of Irish men and women may never become obscured and blunted by the lie of violence, that nobody may ever call murder by any other name than murder, that the spiral of violence may never be given the distinction of unavoidable logic or necessary retaliation. Let us remember that the word remains for ever: "All who take the sword will perish by the sword". 10. There is another word that must be part of the vocabulary of of every Christian, especially when barriers of hate and mistrust have been constructed. This word is reconciliation. "So if you are offering your gift at the altar, and there remember that your brother has something against you, leave your gift there before the altar and go; be reconciled with your brother, and then come and offer your gift" (Mt 5, 23-24). This command of Jesus is stronger than any barrier that human inadequacy or malice can build. Even when our belief in the fundamental goodness of every human being has been shaken or undermined, even if long-held convictions and attitudes have hardened our hearts, there is one source of power that is stronger than every disappointment, bitterness or ingrained mistrust, and that power is Jesus Christ, who brought forgiveness and reconciliation to the world." Klara, 30 & from the Czech Republic: "The Eucharist for me is beyond words. I often when I look at the Host I think about the fact that it’s just bare flesh, the heart of Jesus, and that God is so extremely humble that He comes to us in this way, that He cuts out a piece of his heart and gives it to us and at our disposal, and there are people that are doing bad things to the Eucharist and He still allows us to take Him because He loves us so much." Father Vincent Dike, from Nigeria: "So my prayer, my ordination, my priesthood and my vocation I would say came from my mum, who had been praying earnestly, just like St Monica, the mother of St Augustine. But as a person going through the seminary I remember taking a decision after my junior seminary that I wanted to be a priest. This was when I was 19 years old, I was in the senior seminary and I asked God, 'If you know I will be a good priest, please call me to your altar; and if you know I cannot make this, please help me to go and help out my family in any way your want.' And this journey has been amazing. And now 22 years a priest, I'm happy, I'm joyful, I'm enjoying every moment of it." Leon, 35 & from the Philippines: "Very often we hear arguments: why do I have to go to a priest, why do I have to speak my sins? Well, you see, this is not a draconian requirement put on us by Our Lord but actually a sign of his love, that he has wanted to speak the language of the senses, the language of words and with those languages .. he has wanted to say to us 'I absolve you of your sins. I forgive you.' So that with the very ears with which hear the car horns on the street, the very ears with which we hear the most mundane things, we can hear his mercy. And his mercy spoken specifically to our own words, our own description of our sins. .. That's confession!" You can listen by country to the witness given, by young people in particular, on Totus2us podcasts. Countries represented so far are: Albania, Angola, Antigua & Barbuda, Argentina, Armenia, Australia, Austria, Bahamas, Belgium, Benin, Bermuda, Bolivia, Bosnia Herzegovina, Brazil, Bulgaria, Burkino Faso, Cameroon, Canada, Cayman Islands, Chile, China, Colombia, DR Congo, Congo-Brazaville, Costa Rica, Côte d'Ivoire, Croatia, Cuba, Cyprus, Czech Republic, Dominica, Dominican Republic, Ecuador, Egypt, El Salvador, Eritrea, Ethiopia, Finland, France, the Gambia, Georgia, Germany, Ghana, Gibraltar, Greece, Grenada, Guatemala, Guyana, Honduras, Hong Kong, Hungary, India, Indonesia, Iraq, Iran, Ireland, Israel, Italy, Jamaica, Japan, Jersey, Jordan, Kazakhstan, Kenya, Latvia, Lebanon, Liberia, Liechtenstein, Lithuania, Luxembourg, Madagascar, Malaysia, Malta, Mauritius, Mexico, Mozambique, Netherlands, New Zealand, Nicaragua, Nigeria, Norway, Pakistan, Panama, Paraguay, Peru, the Philippines, Poland, Portugal, Puerto Rico, Romania, Russia, Rwanda, Saint Kitts & Nevis, Saint Lucia, Samoa, Senegal, Serbia, Seychelles, Sierra Leone, Singapore, Slovakia, Slovenia, South Africa, South Korea, Spain, Sri Lanka, Sudan, Sweden, Switzerland, Syria, Taiwan, Tanzania, Thailand, Togo, Tonga, Trinidad & Tobago, Turkey, Uganda, Ukraine, UK, USA, Venezuela, Vietnam, Zambia & Zimbabwe. Countries not included above which Pope Francis, Papa Benedict XVI, St John Paul II &/or Bl Paul VI have visited: Azerbaijan, Bangladesh, Belize, Botswana, Burundi, Cape Verde, Central African Republic, Chad, Curaçao, Denmark, East Timor, Equatorial Guinea, Estonia, Fiji Islands, Gabon, Guam, Guinea, Guinea-Bissau, Haiti, Iceland, Lesotho, Malawi, Mali, Morocco, Myanmar (Burma), Palestine, Papua-New Guinea, La Réunion, San Marino, Sao Tome & Principe, Solomon Islands, Swaziland, Tunisia & Uruguay. "Dear children, My words are simple but are filled with motherly love and care. My children, all the more the shadows of darkness and deception are being cast over you, and I am calling you to the light and truth — I am calling you to my Son. Only He can transform despair and suffering into peace and clarity; only He can give hope in the deepest pain. My Son is the life of the world. The more that you come to know Him — the more that you come close to Him — all the more you will love Him, because my Son is love. Love changes everything; it makes most beautiful also that which, without love, seems insignificant to you. That is why, anew, I am saying to you that you must love a lot if you desire to grow spiritually. I know, apostles of my love, that it is not always easy, but, my children, also the painful paths are paths which lead to spiritual growth, to faith, and to my Son. My children, pray — think of my Son. In all the moments of the day, raise your soul to Him, and I will gather your prayers as flowers from the most beautiful garden and give them as a gift to my Son. Be true apostles of my love; spread the love of my Son to everyone. Be gardens of the most beautiful flowers. With your prayers help your shepherds that they may be spiritual fathers filled with love for all people. Thank you." Totus Tuus - Totally Yours - was St John Paul II's motto, having entrusted his life, his priesthood, his all to Mary. Totus2us is being built with the same intention: to be all Mary's. The play on lettering gives Totus2us a 2nd meaning - Everything2us - as that is what Mary means to us. 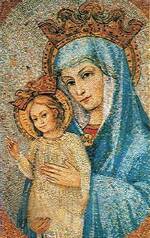 This mosaic of the Madonna and Christ Child is on the front of the Apostolic Palace in St Peter's Square (near the Pope's window for the Angelus prayer). Beneath it is John Paul II's coat of arms and his motto, Totus Tuus; and beneath this is written MATER ECCLESIAE - Mother of the Church. It is a tribute John Paul II wanted to make to Mary for her having saved his life in the assassination attempt on 13th May 1981, the Feast of Our Lady of Fatima. Just 6 months later, on the Feast of the Immaculate Conception, John Paul II blessed the mosaic, a "sign of the heavenly protection of the Sovereign Pontiff, of the Church and of those who are in St Peter's Square." The Chaplet is in Arabic, Czech, English, French, German, Greek, Italian, Latin, Polish, Portuguese, Slovak and Spanish. Tar ever so, muchas gracias, merci beaucoup & all that jazz, coz it's always encouragement! about his apostolate in Colombia with street-children and the work of the charity Let the Children Live. Totus2us was launched on 8th September 2009 as a present to Our Lady on her birthday. May Totus2us always be Totus Tuus, Mother Mary.